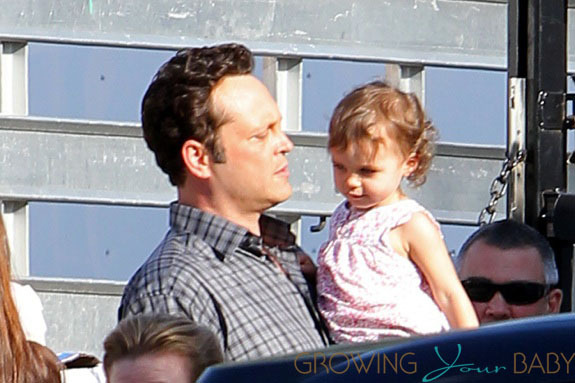 Home » Vince Vaughn and Wife Kyla Expect Baby #2! And baby makes 4! It’s official. Vince Vaughn is due to become a dad again. The actor revealed the exciting news during an appearance on The Ellen DeGeneres Show, which will air on Monday. Ellen prompted Vince to make the announcement by asking if he had news to share about his wife Kyla. To which he responded that they were having another child. The couple, who were married in 2010, are already parents to daughter Locklyn Kyla. While Vince and Kyla have kept their little girl mostly sheltered from the media. She was spotted visiting her dad on the set of his new movie The Internship in the Fall. She’s such a cutie! Congratulations to them.